The opening of a new expansion of the SFMOMA art museum was celebrated just a couple of weeks ago. The intention of the new Snøhetta designed museum, is to increase public access to the museum by creating more room for education for the arts and related fields, to bridge the gap between the exhibiting gallery spaces and unticketed areas, as well as connect the outdoor spaces around the museum. More room to hang out, to meet, to educate, to inspire and to be inspired. SFMOMA opened at its current location in 1995, when the construction was designed by Mario Botta. For the reconstruction, Snøhetta design team had a challenge to double the gallery spaces, and help create a museum, which is a hub for new things to emerge. The refurbished museum aims to bring together American and International arts, while the collections span through gestural modernism and conceptual art, to the emerging contemporary art from the Bay Area. SFMOMA has also promised to reach out to global art communities at large. Oculus Bridge at new SFMOMA. Descending natural light creates deep space. The new SFMOMA proves that it is possible to reinvent an art museum. First, the museum architecture plays a huge role in creating the potential for the artworks that are being installed, as innovative architecture contests the boundaries of the space. This time, museum interior communicates with the exterior. Snøhetta has created a construction, which is seamlessly woven into the existing building, adding into the city’s urban dreams. As a result, the museum goes beyond its construction site, and communicates with surrounding parks and alleys. This proves that the ‘institutional’ side of the museum’s bureaucracy is set in the background, and the numerous stages of the public dwellings offered to the visitors is more apparent. A visitor attains the key role through the alteration of the spatial elements. Having so many choices to play with, the architecture transmits the perception, and creates together with the artworks a unique encounter for each visitor. The architectural line, it’s material continuation inside and outside sparks into multiple directions. Second, art plays with architecture in a new and unexpected ways, and changes the constructions too. With Richard Serra, Sol LeWitt, and Alexander Calder, among others, it’s hard to make the space appear as null. But there is so much art in the world to add into the master classics. New works show as much potential to communicate with the space. A new contemporary art installation inaugurates the museum’s New Work -space. Leonor Antunes, has created work with a title ‘a spiral staircase leads down to the garden’ (2016). This piece communicates with the architecture, showing diverse angles to enter the gallery space. The artist has stated that she carries ghosts with her into her works, in bringing artists, designers, and architects whom she admires to her installations. ‘a spiral staircase leads down to the garden’ is no different, appearing as a continuation of the space as an interior. The handcrafted materials cover the floor, hang from the ceiling, light the space, and block a direct path. The installation shows the artist’s interest in the Modernism, highlighting especially the woman practitioners in the history of craft and design. 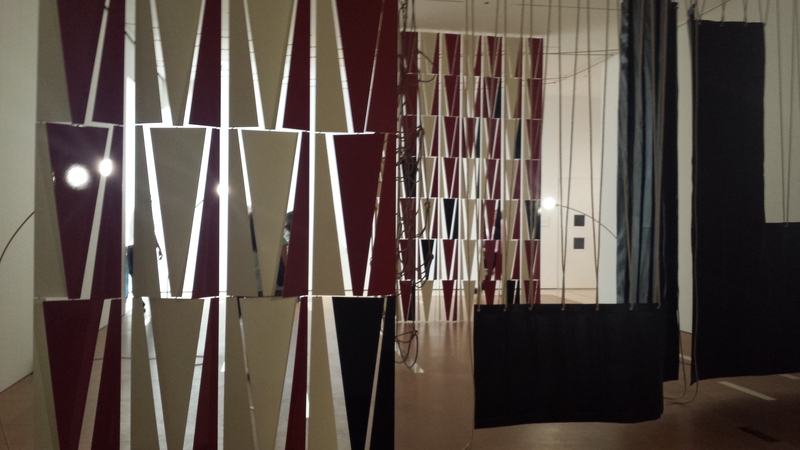 Leonor Antunes, 2016, installation views of her new work at SFMOMA. Leonor Antunes, ‘a spiral staircase leads down to the garden’, 2016, Brass, cork, leather, hemp rope, nylon yarn, monofilament yarn, steel, electric cables, light pulps, brass and Bakelite light bulb sockets, and foam. Courtesy of the artist and kurimanzutto, Mexico City. The Doris and Donald Fisher Collection creates much of the museum’s art collection. In particular, noteworthy is the display around the historic gestural abstraction, which started molding the American Art after the end of the World War II. The movement started to erase questions about the art’s capability to evoke thoughts and feelings. Perhaps it originated in the idea of believing in the healing mechanisms of the art. One work is particularly interesting. Joan Mitchell’s large size triptych ‘Bracket’ (1989), is a great example of the instantaneous moment in art. For her, painting could represent similar forces as the sculpture, forging out the movement and physicality. Joan Mitchell, Bracket, 1989, oil on canvas, is an example of the gestural modernism. The show around gestural modernism is well thought out as part of the SFMOMA’s new opening. It reaches up to redefining the concept of a gesture via selection of works. This becomes a red thread to other artistic displays as well. The museum exhibits plenty of work coming from the plural identities of the Bay Area, yet, some combining elements construct a more cohesive palette. The best part is that the transitional space of the West Coast and its cultural crossroads confuses the pattern of the gesture as something fixed, measured, white and universal. The inside of the culture is turned outside, as much as the architectural environment overlaps both domains. 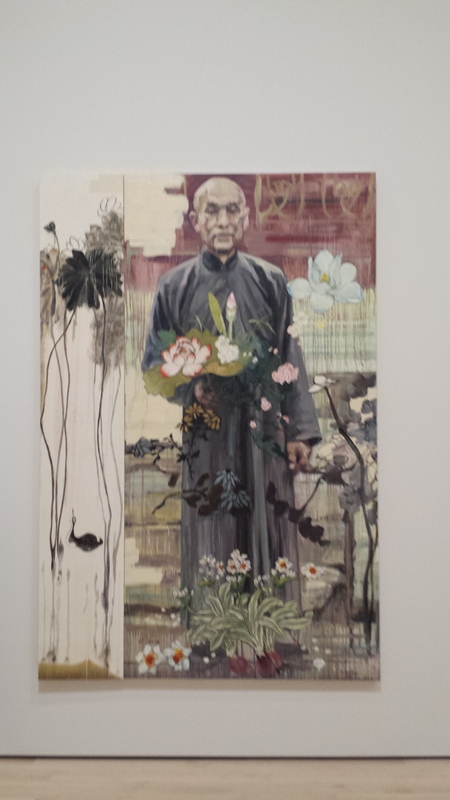 Hung Liu, The Botanist, 2013, oil on canvas. The contemporary artworks do not create separation, but quite wisely culminate in supporting each other. Series of contemporary works follow black and white patterns, with a hip touch of pop art, and borrowing from chic minimalism of American interiors. These could of course be easily absorbed into the world of design and culture lending to Modernist and Postmodernist architectural patterns. Over all, the sometimes too heavy collective experiences are not so much emphasized, and there is more room for subdued artistic politics. Fragmented selves and posthumous experiences, ghosts of the artist’s personal influences as part of the installation define the process in the contemporary art.